In a previous post, I tracked the shift in Parables studies away from the allegorical methods of the medieval church to the “one point per parable” method of Adolf Jülicher. In the next several posts I want to talk about a few other scholars who developed Jülicher’s ideas in the twentieth century (Dodd and Jeremias) and a short note on the rise of literary studies of parables beginning in the 1960’s, using Robert Funk and John Dominic Crossan as examples. In the last few installments of this series I want to cover several studies on the parables published since 1990 which treat the parables as coming from the teaching of historical Jesus, yet also allow for some insight on a literary level, such as Craig Blomberg and now Kenneth Bailey. Kenneth Bailey approaches parables as fair representations of the culture of the Mediterranean world of the first century. Bailey’s method is unique because he reads the parables through the eyes of modern Middle Eastern readers with whom he has lived for many years. Bailey thinks the culture of the Mediterranean world has not changed that much since the first century and many of the unusual elements of the parables can be explained by paying attention to the eastern culture from which the stories first arose. This “oriental exegesis” attempts to read the parables as Oriental churchman have throughout the centuries (Poet and Peasant, 29). In order to do this, one first must know the ancient literature and be able to assess it properly. The most controversial point of Bailey’s method is his insistence that the culture of present Middle Eastern culture is archaic and accurately reflects the culture of the parables. Life changes slowly in the Middle East and it is intentionally traditional. Therefore some cultural phenomenon observed today may in fact go back to the first century. This observation is not new, although the sorts of memoirs which were published in the late nineteenth century as travelers began to visit the Middle East are of varying value. What Bailey seeks to contribute is a method and control for the study of present culture as a window for understanding the first century. Books are of less value to Bailey than personal interviews with people who have spent at least twenty years in the Middle East collecting observations orally, in Arabic. Bailey has found 25 dialogue partners who satisfy this requirement and are also biblically literate enough to understand the point of the questions he put to them concerning the parables. A second methodological consideration is what Bailey calls “theological clusters.” Bailey believes that Jülicher’s belief about the relationship between allegory and parable has been proven false, although the idea that a parable makes a single point persists. Bailey argues that parables are intended to evoke a decision, but the response to a parable is informed by a “theological cluster,” each element of which may be examined separately (Poet and Peasant, 41). It is the point at which all of the theological themes come together that a single response is evoked. A single response is different than a single meaning, the meaning may vary from listener to listener, but there is still only one response. Bailey illustrates this with the Parable of the Sower. The response is “hear the word of the kingdom and bear fruit.” But there are at least four theological points made by the parable which contribute to this response: The kingdom is like a seed growing slowly; God’s grace includes sowing the seed where the ground is unprepared; fruit bearing is an essential part of the kingdom; there is the hope and assurance of a harvest in spite of difficulties. All of these theological motifs (and perhaps others) converge to illicit the response to the parable intended by Jesus. Bailey has been rightly critiqued because he draws very little from rabbinic parallels. Bailey brackets this evidence since it is extremely hard to date evidence from post-Mishnah Judaism, but relies on evidence from modern Mediterranean culture. If the general lines of the culture have survived since the first century in practice, then those cultural elements one finds in the literature like the Talmud may very well be an accurate reflection of first century culture. Charles Hedrick offers a number of criticisms of Bailey’s methodology which ultimately question the value of the study (Hedrick, Parables as Poetic Fiction, 45-46). Hedrick’s most important criticism is the chronological distance of Bailey’s sources. Is it reasonable to think that the Mediterranean culture Bailey experienced in the twentieth century is an accurate representation of the culture of the first century? Despite these criticisms, I find Bailey’s books stimulating and insightful. He has a slightly different perspective that most writers on parables and in almost every case I find his comments helpful for teaching and preaching the parables. Are the criticism of Bailey’s method fair? If there is a problem, perhaps what seems very “preachable” is not accurate – but is the use of contemporary cultural observations valid? Poet & Peasant; and, through Peasant Eyes: A Literary-Cultural Approach to the Parables in Luke. Combined ed. Grand Rapids, Mich.: Eerdmans, 1983. Jacob & the Prodigal: How Jesus Retold Israel’s Story. Downers Grove, Ill.: InterVarstiy, 2005. The Cross & the Prodigal: Luke 15 Through the Eyes of Middle Eastern Peasants. Downers Grove, Ill.: InterVarstiy, 2005. 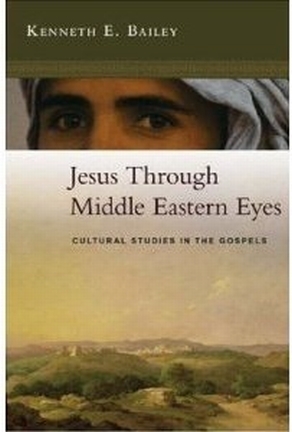 Jesus Through Middle Eastern Eyes: Cultural Studies in the Gospels. Downers Grove, Ill.: InterVarstiy, 2008. Growing up in a different culture than the United States (I grew up in Nairobi,Kenya) has given me a perspective of seeing two different cultures. I think that Kenneth Bailey has the correct idea. If I told someone in the United States one of the African proverbs or folktales they would be able to understand the story, but not the value or how much it means to the people. I like the idea of Bailey writing from the perspective of “Middle Eastern Eyes”; I think that one has to be careful with interpretation as well. Mentioned in the post is the traditionalism and conservatism of the Bedouin tribes, and although they have not changed much, it doesn’t rule out the possibility that they have. I think that criticism is fair, but not to the point of completely disregarding what Kenneth Bailey has to say. As the Berean Jews did, we need to look over Bailey’s text to make sure that they are in accordance with the scriptures, and then glean what we can from his knowledge of Middle Eastern culture in relation to Jesus. Culture is such a vital thing, and must be understood if one is to have deep knowledge of a people group. I look forward to reading some of Kenneth Baileys books. Thanks for this perspective, Scott. (I was hoping you would respond here, but I hate calling out the African students.) I think American cultural imperialism obscures Jesus’ point in many cases,. Bailey can be criticized, but I do enjoy his “take” on things.